It may be one of the larger student organizations on the Illinois campus. It’s definitely the largest of its kind on any U.S. campus. Surprisingly, though, there’s no broad political or volunteer cause driving its numbers. It’s a pre-professional group focused on one industry. 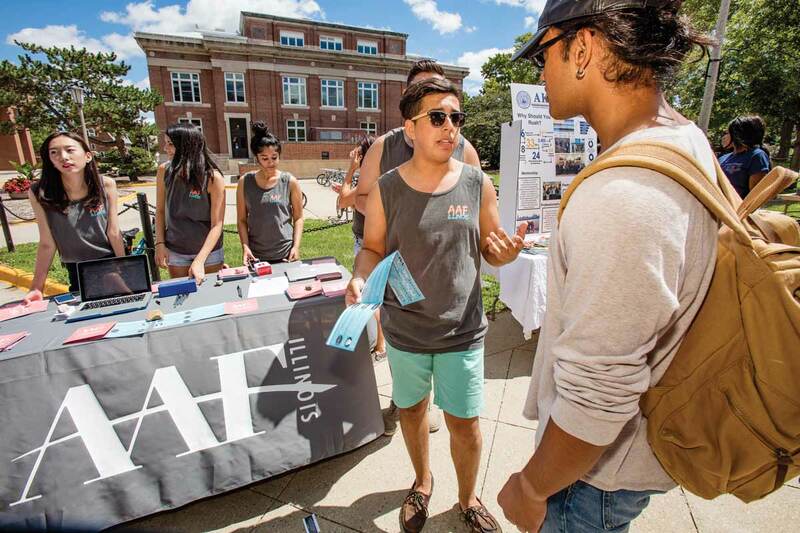 So how is it that the American Advertising Federation student chapter at Illinois typically has over 500 members? And also wins more than its share of national awards? For one thing, promotion is in its DNA. (Members understand the need for advertising, after all.) On Quad Day, the student organization fair held early each fall, AAF is an active recruiter. It not only staffs a table, but also sends members out into the crowd, talking one-on-one about what the group does and the benefits of joining. “People remember that,” said last year’s AAF president, Hanna Cannell, an advertising major and May graduate from South Beloit, Illinois. Student ambassadors then make their case in classrooms, in and outside advertising. “We want designers, engineers and computer science majors who can do all the technical stuff,” Cannell said. They also want writers, poets, artists, web developers and “social media mavens,” according to the group’s Quad Day brochure. A part of the group’s pre-professional activity revolves around its in-house agencies, which are structured to operate like professional ad agencies, digital agencies, event-planning companies, multicultural agencies and nonprofits. Each agency caters to a different mix of student skills and skill levels, types of media and clientele, serving real clients in the local area and beyond. Committees within AAF plan the organization’s many social and professional events, as well as community outreach and volunteer activities, diversity initiatives and a mentorship program. Two big events each year are trips to Chicago and New York, where students visit an array of advertising and media companies. As part of that, they get the chance to network with professionals, many of them Illinois AAF alumni, and often land summer internships or jobs. There’s also a team that spends the year developing a campaign for a corporate client in AAF’s National Student Advertising Competition, and the Illinois chapter has made multiple trips to the national finals. Even more impressive, however, the U. of I. chapter has won the AAF College Chapter Membership Award every year for over a decade as the largest of more than 200 U.S. chapters. It has also had more individual placements than any other college chapter over the history of the competitive Vance and Betty Lee Stickell Student Internship program, as well as the most winners in the AAF’s prestigious Most Promising Multicultural Student program. “We are very good at producing very talented and industry-ready individuals,” Studer said. Faculty adviser Hall was also honored in 2015 as AAF’s Distinguished Advertising Educator for that year.